Financial markets can sometimes seem impenetrable, subject to unpredictable forces. At Harvard Business School, however, two researchers believe they have found a means of anticipating the movements of individual companies’ stock prices, at least. Simmons professor of business administration Lauren Cohen and Coleman professor of financial management Christopher Malloy claim that firms publish reliable indications of their future financial performance in yearly and quarterly reports. But—as they write in their recent working paper “Lazy Prices” (coauthored with Quoc Nguyen, now an assistant professor at DePaul University)—investors simply are not paying enough attention to notice. By law, all publicly traded firms publish 10K (annual) and 10Q (quarterly) reports, thereby alerting shareholders to significant risks that could affect returns. Investors can sue over the omission of foreseeable problems, giving firms strong incentives to include even the tiniest details. As a result, the reports have lengthened over time: Apple Inc.’s 2018 iteration runs 85 pages. They are also dense and repetitive, with many firms printing nearly identical reports year after year. Yet Cohen and Malloy found significance in the exceptions to this uniformity. Analyzing thousands of documents beginning with 1995, they measured the year-to year changes firms make in the language of their reports, finding that variability “significantly predicts future negative earnings surprises.” (The vast majority of alterations are negative in tone.) When firms make such changes, Cohen explained in an interview, “that has a huge amount of information for future firm operations and for returns.” In some cases, the predictive nature of alterations is only sensible: When firms report a CEO’s departure, for example, performance is likely to change. Yet even innocuous textual changes, such as an increased prevalence of words suggesting uncertainty, tend to portend diminished returns. One might expect investors to monitor this rich source of information closely—but that has not been the case. Instead, they often react to issues discussed in reports only after public announcements on the same topic, leading to a lag in the reaction of prices (which are thus “lazy”). In 2018, for example, Apple’s 10K warned investors about the implications of the U.S. trade war with China. “Three or four weeks later,” Cohen recounts, “they announced the same thing publicly”—and only then did prices plummet. “So,” he continues, “had you read the 10Ks, you could have made a quick 10 percent on the world’s most liquid stock.” The problem is one of inattention. The researchers posit several reasons why investors might ignore this crucial information. One is the lack of comparative language: most reports do not directly address how they differ from the previous year’s. (Cohen and Malloy found that investors are more likely to respond appropriately to reports that do contain such language.) 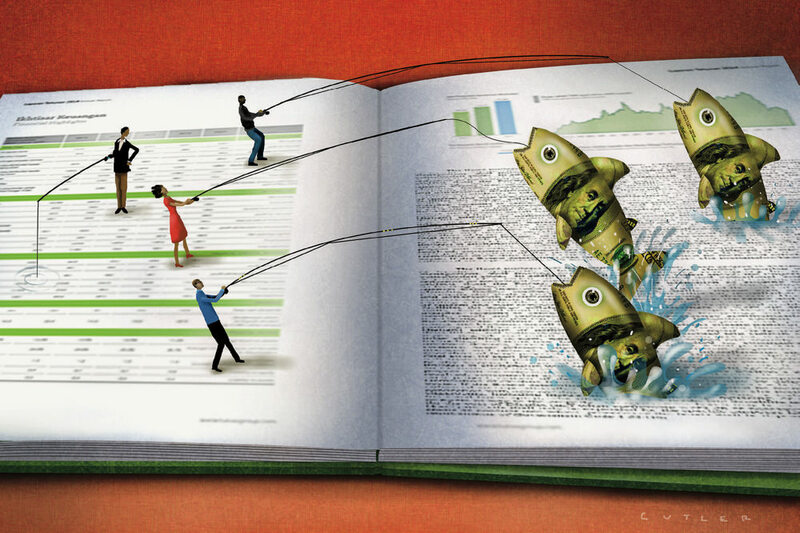 In addition, investors’ training in finance may engender a preference for quantitative measures of performance, such as earnings per share, over paragraphs of text. Investors are simply neglecting to expend the energy necessary to scrutinize these documents. For modern investors, he says, there is “an infinite amount of information deluging you, in some sense”—and that deluge can cause important details to be overlooked, especially when details are harder to parse than quantitative data like a firm’s stock-market value. Cohen and Malloy are now approaching the same problem from a different direction, investigating how investor attention affects a firm’s performance. Since “Lazy Prices” was published, they have seen their results replicated several times. They have also seen financial companies specialize in work informed by research like theirs, comparing documents qualitatively over time. Moving forward, the authors expect that such research will motivate investors to pay more attention to these documents, despite the inherent “frictions” involved. The result could be an arms race of sorts between firms and investors. Faced with a more attentive set of investors, firms could attempt to make the most important information harder to find. But the federal mandate on firms—and the potential lawsuits that could arise from nondisclosure—limit that strategy. “One weapon on the firm’s side,” says Cohen, “is that there’s no mandate on how long these things can be. They can keep adding, they can obfuscate, move things around.” The computing tools that Cohen and Malloy used to compare reports against each other will help investors combat these maneuvers. “What you’ll see,” predicts Cohen, “is an equilibrium of those two sides.” Malloy adds that “then, you’d expect to see less predictability. The subtle and interesting part of this,” he says, is that the equilibrium remains undefined. “You see both sides playing,” presenting a dynamic relationship in which either side could conceivably take the upper hand. Papers like “Lazy Prices” might prompt more informed investment decisions, but as firms respond, the target will continue to move.